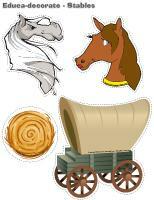 Children will gallop through this theme?s activities to build motor skills, horse crafts, and games. 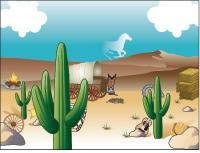 Add horses to your decor with our printable thematic poster, picture game, educa-decorate document, and models. 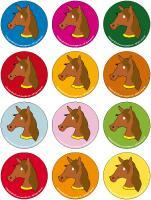 (Open thematic poster-Stables) Print, laminate, and decorate the walls of your daycare with all kinds of posters. 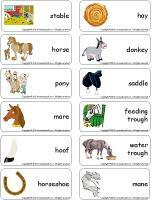 (Open educa-decorate-Stables) Print, cut out, and laminate. Use the illustrations to decorate the walls of your daycare and hang them from the ceiling to set the mood throughout the theme. Find various pictures of horses. Laminate them and display them on the walls. Hang plastic horse figurines and cowboy hats from the ceiling. Different lengths of rope which look like lassos can also be used to decorate. This special tool was created in response to a special request received. (Open educ-poster-Letter J) Print and laminate. 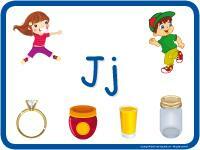 Display and use the poster to introduce children to the letter and letter sound. Have you ever touched a horse? What color horse do you prefer? Do you know what we call the place where horses live? 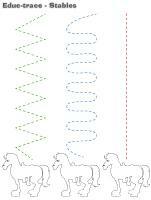 When a horse is trotting, how is it moving? When a horse is galloping, how is it moving? What can a horse pull? Collect old broomsticks and turn them into horses simply by adding drawn horse heads. Wear a cowboy hat or a bandana to greet children in the morning. If you wish, you can buy inexpensive cowboy hats for your group. Let children wear their cowboy hat throughout the theme. Create a pretend campfire and sit around it during circle time. The pictures may be used as a memory game or to spark a conversation with your group. Use them to decorate your daycare or a thematic corner. 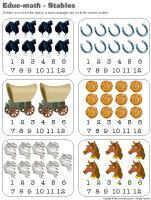 (Open picture game-Stables) Print, laminate, and store in a Ziploc bag or in your thematic bin. (Open picture game-The ranch) Print, laminate, and store in a Ziploc bag or in your thematic bin. 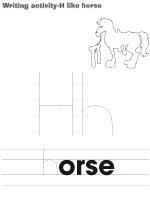 (Open writing activities-H like horse) (Open writing activities-R like ranch) Print for each child or laminate for use with a dry-erase marker. (Open stationery-Stables) Stationery is available for each theme. Use it to communicate with parents, in your writing area, or to identify your thematic bins. 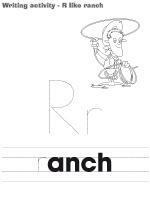 (Open activity sheets-The ranch) Activity sheets are suggested for each theme. Print and follow instructions. Blocks shaped like logs can be used to build western homes. Objects found in nature (coniferous branches, leaves, pinecones, etc.) can be used to build a cache. A hay bale can be an interesting addition to your area, but beware of allergies. A horse drawn on a large piece of cardboard. Children can glue pieces of white, brown, or black yarn on it to create the mane and tail. Hang a large piece of paper on a wall and paint using water guns. A drop of paint or food coloring is all you need to add color. Make a sleeveless cowboy vest out of a brown paper bag. Help children cut it out and let them decorate their vest as they wish. Yellow, orange, and red cardboard can be used to represent flames while empty cardboard tubes can represent logs. Use them to create a pretend campfire. A water bottle can become a flask... just add string and masking tape. Sand can be glued on a drawing to represent a sandstorm. Make original "wanted" signs and add a picture of each child. Make your own gold pieces. 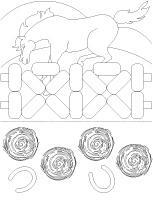 Cowboy or farm animal coloring pages. White paper which can be used to create cowboys and dream ranches. Charcoal drawings to represent the coal which was used by cowboys. Cowboy costume: cowboy hat, jeans, shirt, vest, cowboy boots, etc. Survival camp: sleeping bag, lantern, camping material. Add a pretend campfire and a few musical instruments. Pretend to cook over a campfire. Offer pots and pans, barbecue forks (add duck tape to the ends), etc. Transform your area to make it look like a caravan. Simply line up a few chairs and drape a blanket (or your parachute) on top. If you have a wooden barrel or a wooden basket, use it in your area. Modeling dough and toothpicks can be used to make cactuses. A memory game related to the ranch (see educatall club) or a store-bought version. A cardboard cowboy hat for lacing. A long rope which can be used as a lasso. Small ropes which can be used to practice making knots and bows. Different lengths of rope for sorting from shortest to longest. Modeling dough and horse figurines to make impressions. If there is a stable close to your daycare, ask the owner if he could lend you a saddle. Books about horses, ranches, and cowboys. Your local library probably has a great selection. You may also ask parents if they have any on hand. Books about the Far West. 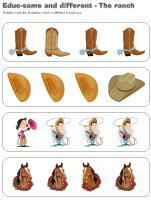 A connect the dots cowboy hat activity sheet. An obstacle course set up to represent a treasure hunt. You will need a list made up of pictures of objects belonging to cowboys. Have children search for the items (actual objects or illustrations). Dart game, but using tiny balls wrapped with Velcro. Inexpensive versions are easy to find, but you can also make your own. A sand table containing sieves and shiny pebbles to search for (gold pieces). Container filled with straw and precious stones to search for. Container filled with oats and horse figurines. Dye bandanas. Simply take pieces of white cotton, cut them, and try a variety of dyes (chemical or natural). If you prefer, use fabric markers. Grow grass (to represent hay) to feed the horses. Prepare your own trail mix using a variety of cereal, nuts (beware of allergies), pumpkin seeds, sunflower seeds, etc. Take your trail mix along when you go for walks. Serve chicken nuggets and pretend they are gold pieces. Prepare a "horse snack" by mixing together Mini Shredded Wheat cereal (hay bales), Cheerios (oats), and dried apples. Make your own chili casserole and serve it for lunch. Cheez Whiz and pretzels are perfect for creating tiny snacks which look like campfires. (Open box sounds and pictures-L and R) Print the different illustrations which all represent words that begin with the letters "L" or "R". Use them to practice these sounds with your group. (Open scene-The stable) Print, laminate, and cut out. Children use the pieces to create scenes. (Open game-This is my spot-Stables) Print two copies. Laminate and cut out the cards. Glue one copy of each card on the table using adhesive paper. Drop the other copies in a bag. Children take turns picking a card to determine their spot at the table for the day. You may also use the cards to determine naptime spots or for your task train. Have children move around the daycare like horses. If you ask them to trot, they must walk, lifting their knees very high, whereas if you ask them to gallop, they must move like a race horse while running in place. Of course, expect to hear many whinnying horses. Show babies the sounds farm animals make. Practice the sounds throughout the theme. They will have lots of fun and surprise you! 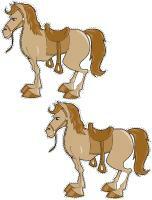 (Open educa-decorate-Stables) Print the illustrations and laminate them. Hang them from a hanger over your changing table. If your ceiling isn't too high, you can also hang them directly from the ceiling. Select three children who will be cowboys. The other children are the cowboy's herd. Deposit a few hula hoops on the floor to represent gathering spots and determine an area which will represent an enclosure for captured cattle. Children who are part of the herd must run from one hula hoop to another. If the cowboys capture them, they must go to the predetermined enclosure and stay there until the end of the game. The last three children to be caught will be the cowboys for the next round. You will need a strong rope. Mark the middle of the terrain or area using colourful adhesive tape. Divide your group into two teams as equally as possible. Each team holds one end of the rope, pulling in an attempt to pull the other team across the centre of the predetermined area. Select a child to play the role of the sheriff. The sheriff must catch the robbers (the other children) and send them to prison (a designated area). (Open pin the tail on the donkey) Print. 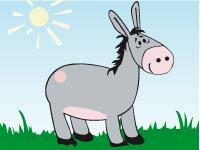 Display the donkey on a wall or fence. Blindfolded, children must attempt to attach the donkey's tail as close to the correct spot as possible. Determine two lines, one in front of the other. All the horses (children) must stand on one of the lines, side by side. Roll a die (a giant one if possible). The number on the die will determine how many steps the horses can take. Keep rolling the die until all the horses reach the finish line. Set up an equestrian obstacle course in your backyard. Include a balance beam your little horses can jump over, a lake (a piece of blue cardboard) they must avoid, cones they must gallop around, etc. Children gallop along the obstacle course with a broomstick horse between their legs. Set a few hula hoops on the ground and encourage children to gallop from one circle to another without touching the edges. Set up one or more plastic horseshoe games in the yard. Invite children to test their cowboy abilities. Hang several targets on your fence and have children try to hit them using Velcro-tipped darts, Velcro-wrapped balls, paper balls, bean bags, water guns, etc. Set up a variety of obstacles in the yard (tunnel, balance beam, stilits, etc.). Ask children to complete the course several times as part of their cowboy training. Show children how to jump rope. Tie one end of the rope to a fence and turn the rope for younger children. Older children can try using individual jumping ropes. Use old pillowcases or sturdy bags and organize races with your group. You will need musical instruments. Use them to explore a variety of rhythms with your group. Show children the difference between trotting and galloping. Have them trot (walk) while using the instruments to produce a slow rhythm and gallop along (run) while using the instruments to produce a fast rhythm. Play country or western music and teach your group a few dance steps. Let them dance as they please and join them. You may let them select cowboy clothing from your costume bin to add to the fun. Organize a trip to a ranch or equestrian centre. Ask parents to join you. 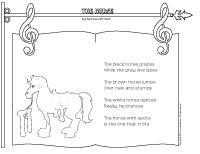 (Open educ-trace-Stables) Print for each child. Children must trace the lines using the correct color and then color the object at the end of each line using the same color. 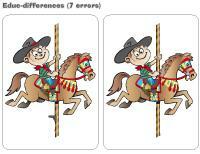 (Open educ-differences-Stables) Print and laminate for durable, eco-friendly use. Children must circle the correct number of differences. (Open educ-math-Stables) Print and laminate for durable, eco-friendly use. Children must count the objects in each rectangle and circle the correct number. 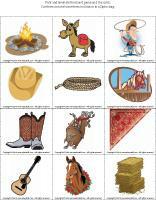 (Open story and memory game-Cowboys and Indians) Print, cut out, and laminate the cards. Place them face down on the floor. Invite children to pick three cards and invent a story in relation to the illustrations. 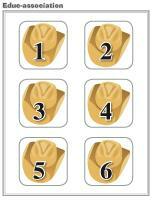 Variation: Print two copies and use the cards as a memory game. (Open magnifying glass game-The ranch) Print and laminate the board game and the cards. Cut out the cards and store them in a box or Ziploc bag. Children pick a card and search for the item on the board game using a magnifying glass. Once they have found the item, they deposit the card in the corresponding square, on the board game. (Open educ-association-The ranch) Print and arrange the pages in a file folder. Cut out the cards and encourage children to associate them. Once they have correctly associated a card, they can attach it to the corresponding square in the file folder using Velcro or adhesive putty. (Open educ-same and different-The ranch) Print and laminate for durable, eco-friendly use. Children must circle the illustration which is different in each row. (Open hunt and seek-The ranch) Print and laminate. Children pick a card and search for the item in the scene. (Open educ-big and small-The ranch) Print and laminate. Children must place the cards in the correct order on the board game, from smallest to biggest. (Open game-Cowboy or Indian) Print and laminate. Display the two illustrations on the wall. Using Velcro, children must associate the cards to the correct picture. If you have hay bales, arrange them in a corner of the daycare. Let children wear their cowboy hats and organize a photo session. If you prefer, simply photograph children as they are "riding" their broomstick horses. Make your own pretend campfire using yellow, orange, and red tissue paper and a few pieces of wood. Let children play musical instruments and sing songs around your pretty fire. Have one child wear a cowboy hat. He must sit, with his back to the rest of the group. Point to a child and have him stand up and say, "Hey cowboy!" The child wearing the cowboy hat must guess which child called out to him. Bring a popcorn machine to the daycare and demonstrate how it works. Explain why the kernels' appearance changes when heated. Give each child a small container, soil, and grass seeds. Let each child plant the seeds. In just a few days, they will be proud to see their "hay" grow. You may choose a child to water everyone's hay each day. Once the grass is fairly long, let children cut it with scissors. Fill a bin with a variety of cereals and grains. Add small containers, spoons, and small horse figurines children can play with. Fill a large container with sand and hide plastic gold pieces in it. Encourage children to search for them. You may choose to count the gold pieces to see which child found the most. Purchase a cactus. Explore it with your group using magnifying glasses. Being a cowboy requires lots of energy! Provide several different kinds of cereals, dried fruit, and grains and let children prepare their own snack mix. Melt marshmallows slightly in a microwave oven. Melt a small amount of chocolate too. Dip the marshmallows in the chocolate and then place them between two Graham cookies. Squeeze and enjoy! (Open craft-horseshoe) Print and trace the model onto heavy cardboard (cereal box for example). Cut the horseshoe out and wrap it with aluminum paper. (Open puppets-Stables) Print the puppet models on heavy cardboard. Have children cut them out and decorate them using a variety of arts & crafts materials. Attach Popsicle sticks to the back of each model to make puppets. (Open models-Horse) Print. Have children cut out their horse. Provide pieces of yarn and tissue paper in neutral colors (beige, brown, gray, white). Let children glue the material on their horse. (Open farm animals) Print. Hang a paper banner on the wall. If you wish, you may have children paint the banner to make it look like a farm scene (the bottom can be painted brown or green and the top can be painted blue). Have children cut out the farm animals and add them to their banner. Make a collage using small pieces of yarn (to represent a horse's mane). Use a brown paper grocery bag to make a sleeveless cowboy vest. Help children cut their vest and then let them decorate it. Collect several shoeboxes (ask parents if they have some). Let children paint the boxes. Glue an empty paper towel roll to each box to represent the handle. Once dry, wrap rubber bands around the box to make a guitar. Show children how to pinch and pull on the rubber bands to make music. (Open models-rodeo) Print for each child. Encourage children to color the items and cut them out. 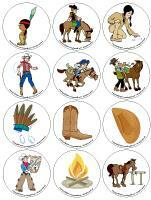 Give each child a piece of white cardboard and let them glue the rodeo elements on it to create a rodeo poster. (Open sheriff badge) Print and cut out. Decorate the stars using glitter. Children will proudly wear their sheriff badge. (Open creative coloring-The ranch) Print for each child. Encourage children to draw a ranch. 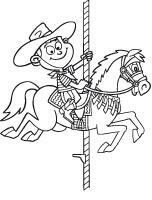 (Open coloring pages theme-Stables) (Open coloring pages theme-The ranch) Print for each child.